When it comes to bedding, research from the dairy cattle world can inform us about what is good for horses. 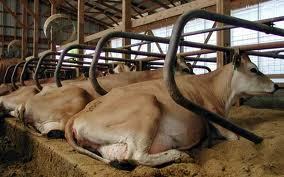 Cow that lie down produce more milk than cows that stand up -- lying down stimulates milk production. Cows lie down when they are comfortable lying down, so they do studies on what surfaces are comfortable to lie upon. Studies from both in Europe and North America are done on bedding, mats, and mattresses in stalls, and cow preferences for each. The data coming back is that mat, no mattress, no fabulously soft flooring material can ever be a replacement for deep bedding. Cows prefer deeply bedded concrete flooring to lightly bedded mats. Keeping in mind that cows are heavier than horses -- but the gold standard of cow bedding depth is 8" or 20 centimeters. It has been shown that lying time on sand bedding declined by approximately 10 minutes per day for every 1 cm of reduction in the depth of sand. In addition, a decline in bedding quantity leads to a rise in moisture levels, resulting in increased bacterial counts on both the bedding and the teats. Bedding with less moisture is preferred by cows. The risk of thrushlike dermatitis also increases with decreasing amounts of bedding. Cows housed in deep-bedded sand stalls have a lower prevalence of lameness than cows housed on mattresses with little or no bedding. Bedding on Geotextile Mattresses: How Much is Needed to Improve Cow Comfort? I remember reading a study (can't remember where) that horses prefer straw over other types of bedding.